Olentangy Liberty’s Abby Erickson (13) puts up a shot between a pair of Teays Valley defenders during the first half of Wednesday’s non-league showdown in Powell. POWELL – The Olentangy Liberty girls basketball team seemingly missed from 3-point range in every conceivable way. And no, Newark didn’t have a lid on the rim – it only seemed that way. Fast forward to a night later and the Patriots zeroed in on their target. They connected on seven triples in the second quarter alone, including five during a 19-3 run to break a 10-10 tie. 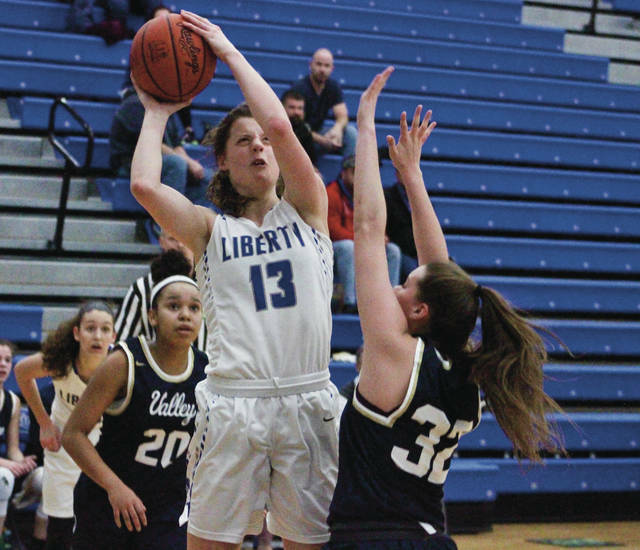 Kelly Levering knocked down three during the run, four overall, and finished with 19 points, leading Liberty to a lopsided 65-38 win over Teays Valley Wednesday in non-league play. Levering assisted Teegan Pifher on a short jumper to break the tie with 6:20 left in the half and then assisted Caitlin Splain on the next possession to push the lead to 15-10. Kiera McClosky followed with a 3 before Megan Bush answered for TV. Levering connected on her first off a Jessie Barna offensive rebound and assist. She followed with back-to-back triples after a pair of Pifher free throws – both off of Barna assists – and just that quick Liberty led 29-13. Pifher and Betsy Merritt each knocked down 3s as Liberty pushed the lead to 35-18 at the break and never looked back. Pifher finished with 17 points and McCloskey added nine for the Patriots (14-7), who had dropped three of four coming into Wednesday’s game. Liberty finished with 18 assists on 24 made baskets, led by Levering and Barna with four apiece. Barna had 12 rebounds, Levering had nine and Pifher finished with eight for Liberty, which is the Central District’s 10-seed in the upcoming tournament. Kierstyn Liming had 14 points and Bush added 11 to lead the Vikings (17-3), who had an 11-game winning streak snapped. Liming, Bush and Bri Russell each pulled down 11 rebounds to lead TV, which is the 11-seed in the district tournament. Liberty concludes its regular season Friday night at Westerville Central. The OCC-Buckeye contest is scheduled to start at 7:30 p.m.